Imagine: you are window-shopping on a quiet street, perhaps in London or Paris or New York. Something remarkable catches your eye: an ancient coin, a gold chain, a tiny figurine. Impulsively, you enter the shop, where the owner explains to you that the sculpture comes originally from Mesopotamia, that the necklace is Byzantine. It isn't inexpensive, but the shopkeeper has guaranteed its provenance and the price seems fair; and besides, you quite love it. You say yes, and leave the shop with your new treasure tucked safely in a bag. You may have just handed your money over to the Islamic State. According to antiquities experts and members of the Council on Foreign Relations, the plundering and sale of ancient artifacts from Syria and Iraq has become big business for the Islamic State (ISIS), contributing significantly, as the Guardian reports, to the income stream that has "made it the most cash-rich terror group in the world." Indeed, according to NBC News, "Antiquity plundering - particularly from violence-riddled Syria and Iraq - fuels a $7 billion black market, and some of that money lands in the pockets of terrorists." Much of that cash stream comes straight out of European and American pockets. In addition to what shows up at souvenir stores in tourist areas of Lebanon and Turkey, the Guardian's investigative reporting located items at various shops in central London. Others say these antiquities from Syria and Iraq, which could be worth anywhere from $250 to a few hundred thousand dollars each, frequently turn up at legitimate auctions in the U.S. and Europe. ISIS hires its own plundering teams to dig out archeological items, and then to sell them via a network of brokers and other middlemen, Amr Al-Azm, a Syrian archeologist at Ohio's Shawnee State University, said in an interview. In addition, the terrorist group imposes taxes on local looters of anywhere from 20-50 percent for anything they sell. As a result, ISIS profits handsomely from the overall antiquities trade, which experts say follows a trail from Syria to Beirut or, more frequently, to southern Turkey, and from there directly on to Europe – and, on occasion, to America. Making matters more complicated, say experts, European and U.S. dealers usually are not even aware that the items were recently looted. Objects are often brought in by someone who claims they've "been in the family" or that they are from another region altogether – and not all dealers have the connoisseurship to recognize the difference, the Guardian reports. Just how much money is ISIS making off of archeological plunder? Opinions vary widely. Mark Vlasic of the joint World Bank-UN Stolen Asset Recovery Initiative cites reports that the antiquities stolen just from al-Nabuk earned the terrorist group about $36 million. But Al-Azm contests that figure. "I know that museum," he told me by phone. "The millions they say were looted from there – the museum didn't have that kind of stuff in it in the first place; those figures are simply bogus." Despite what he considers sensationalized reports, al-Azm estimates that IS's earnings from the antiquities market amount to "no more than a few million dollars per year." But even "a few million dollars" is significant. As Al-Azm observes, "it's not as important as oil or the revenue they make from taxes or robbing banks or kidnapping." But it's clearly "significant enough that they're willing to invest their own resources into doing it themselves." Antiquities looting is hardly new – it's been part of our culture for millennia, and the looting done in Syria and Iraq is no different. And NBC reports that, "In 1999, while seeking to raise money for the planned 9/11 attacks, one of the hijackers, Mohammed Atta, tried to sell a cache of pilfered Afghan artifacts in Germany." Moreover, because as al-Azm notes, "everyone in Syria lives either on top of an archeological site, next to an archeological site, or a stone's throw away from an archeological site," many ordinary Syrians have themselves begun digging around in nearby sites and fields to "eke out a living now that their traditional sources of revenue are all but gone." The difference, of course, is that for them, such endeavors provide a means for them simply to survive – not to kill. But when they are forced to pay taxes to ISIS for their finds, the picture changes. ISIS is not the only such group involved in financing its aggression through the trade of 8000-year-old cultural treasures. Sam Hardy, an expert in conflict antiquities at University College, London noted via e-mail that Al Nusra and the Assad regime do the same, leading Vlasic and others to refer to these artifacts as "blood antiquities." 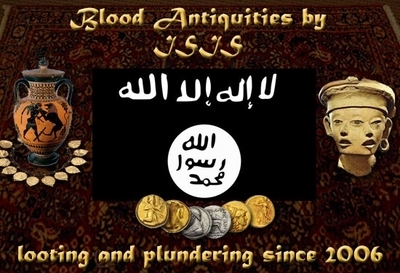 The name is apt, particularly with ISIS, which cleverly sells its caches of ancient jewels and coins, of mosaics and figurines, to British and Belgian and American collectors in order to finance its beheadings of Brits, Belgians, and Americans. It is this even more than the vicious destruction of cultural heritage, the erasing of the past, that makes ISIS's trade in antiquities so particularly gruesome. We are, in essence, through our own materialism, inadvertently financing those who most seek to destroy us. We are even buying them the weaponry to do it. Is there a way to stop it? Vlasic has called for an "engagement group" to police artifacts trafficked out of conflict zones. But the truth is, these smugglers are too good to be caught, and the profits are too high for them to be discouraged. Al-Azm and Mark Altaweel, an archeologist at University College, London, who helped uncover examples of Syrian plunder in London for the Guardian, have only half-jokingly suggested another strategy: flooding the market with fakes. Alternatively, he proposed via e-mail, one could try "the stigma approach, where people just start more and more associating these things with funding death." Or maybe we should think of avoiding any questionable purchases simply as another weapon of our own, a means fighting terrorism and of saving lives – including our own.